The Smashing Pumpkins just released a brand new music video and let’s just say, things are about to get ghoulish. On Monday (Oct. 15), the Chicago-founded band unleashed the music video for their latest single “Silvery Sometimes (Ghosts).” The six-minute clip begins with the band standing in front of a haunted house surrounded by fans and Mark McGrath. McGrath plays the role of a DJ from a local radio station that is hosting an interesting challenge. The challenge is simple; spend the full night in the haunted house and the station will donate money to any charity of the winners’ choosing. At first, the band members think it’s going to be an easy challenge, but things start to take a turn for the creepy. A “Goosebumps”-esque puppet comes to life and steals some glasses. A ghostly figure appears out of nowhere and looks like its ready to take its victim to the afterlife. A set of “twins” appear next to the bed of one of the guys all dressed in white. Then, there’s the ongoing lightning storm in the house that will not go away. As the guys start roaming the house, they stumble in to a room. Sitting in the room, minding their own business are the shadowy characters while the mastermind behind the creepy encounters is caught red-handed. Watch the music video for “Silvery Sometimes (Ghosts)” above. The clip was directed by Corgan and longtime visual collaborator Linda Strawberry. “Silvery Sometimes (Ghosts)” is featured on the Smashing Pumpkins’ upcoming new album, Shiny and Oh So Bright, Vol. 1: No Past. No Future. No Sun. The forthcoming Rick Rubin-produced record is due out Nov. 16. Though the band has spent most of 2018 on the road in support of their reunion, the group has announced a handful of intimate anniversary shows. Those dates can be seen below. This entry was posted in Music News, Music Videos and tagged music, music news, music video, Shiny and Oh So Bright, Smashing Pumpkins, The Smashing Pumpkins, tour, tour dates, tour dates 2018. Bookmark the permalink. Months after announcing a partial original lineup reunion, the Smashing Pumpkins have unleashed the quasi-reunion’s first new song in 18 years. On Friday (June 8), the Chicago-founded group premiered their new tune, “Solara.” Listen to the brand new song above which clearly sounds like it could find a home among the group’s early records. Per a statement from the Smashing Pumpkins, “Solara” was recorded at Shangri La Studios in Malibu, California with super-producer Rick Rubin and the band’s longtime guitarist Jeff Schroeder. While the Smashing Pumpkins have yet to confirm whether this song will be featured on their new, in-the-works album, it’s safe to assume that the new tune will be included on its track listing. Back in February, frontman Billy Corgan confirmed that three-fourths of the original lineup —Corgan, guitarist James Iha, and drummer Jimmy Chamberlin— had reunited and were about to begin recording eight new songs with Rubin. In support of their reunion, and new music, the Smashing Pumpkins will hit the road this summer for their “Shiny and Oh So Bright” tour. The “Shiny and Oh So Bright” tour will begin on July 12 at the Gila River Arena in Glendale, Arizona and conclude almost two months later on Sept. 7 at the Ford Idaho Center in Nampa, Idaho. The trek will find the band performing at arenas in major cities across the continent including Dallas, Miami, Atlanta, Montreal, New York, Boston, and of course the band’s hometown of Chicago. The tour’s set list will reportedly include songs from the band’s first five albums; 1991’s Gish, 1993’s Siamese Dream, 1995’s Mellon Collie and the Infinite Sadness, 1998’s Adore, and 2000’s Machina/The Machines of God. The complete itinerary for the “Shiny and Oh So Bright” tour can be found here. This entry was posted in Music News, Streaming and tagged music, music news, new music, Smashing Pumpkins, stream, streaming, The Smashing Pumpkins. Bookmark the permalink. Let’s file this under “news we already knew about.” Following days of teasing on social media and a countdown clock on their website, the Smashing Pumpkins have finally confirmed plans to hit the road this summer. On Thursday (Feb. 15), the Chicago-founded band officially announced their “reunion” tour. 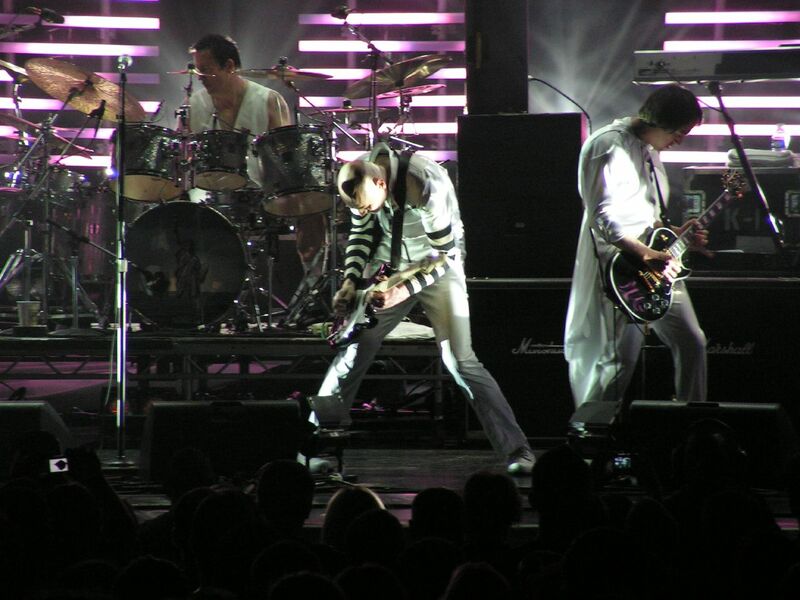 The tour, which has been named the “Shiny and Oh So Bright” tour, will feature three-fourths of the original lineup (frontman Billy Corgan, guitarist James Iha, and drummer Jimmy Chamberlin) performing at venues across North America. The “Shiny and Oh So Bright” tour will kick off on July 12 at the Gila River Arena in Glendale, Arizona and wrap up almost two months later on Sept. 7 at the Ford Idaho Center in Nampa, Idaho. The trek will also include stops in major cities across the continent such as Dallas, Miami, Atlanta, Montreal, New York, Boston, and of course the band’s hometown of Chicago. Tickets for all the shows will go on sale beginning next Friday, Feb. 23. According to the band’s tour announcement video, which can be seen above, the group will perform tracks from their first five albums; 1991’s Gish, 1993’s Siamese Dream, 1995’s Mellon Collie and the Infinite Sadness, 1998’s Adore, and 2000’s Machina/The Machines of God. As evident by all the back and forth in the press between Corgan and former bassist D’arcy Wretzky, Wretzky will not be included in the upcoming tour. The complete tour itinerary for the “Shiny and Oh So Bright” tour can be seen below. This entry was posted in Music News and tagged music, music news, Shiny and Oh So Bright tour, Smashing Pumpkins, The Smashing Pumpkins, tour, tour dates, tour dates 2018. Bookmark the permalink. While there seems to be a lot of drama going on behind the scene at camp Smashing Pumpkins, there does seem to be some major good news for fans coming soon. On Wednesday (Feb. 14), Live Nation posted a short, 30-second clip on their social media accounts, igniting speculation that the iconic 90s band will be hitting the road soon. The short clip follows an ice cream truck, very similar to the one from the “Today” music video, as it goes around town. In between shots of the ice cream truck and the ice cream man traveling around the city, there are shots of the outside truck where lyrics from some of the Smashing Pumpkins songs are displayed. Throughout the clip, the ice cream man is seen handing out envelopes instead of ice cream to those eager ice cream lovers. The video ends with the screen going black and the Smashing Pumpkins’ website link appearing on the screen. In a not-so-much-a-coincidence twist, the band’s album, Siamese Dream with contains both “Disarm” and “Today,” will turn 25 in the summer. This entry was posted in Music News and tagged announcement, music, music news, Siamese Dream, Smashing Pumpkins, tour. Bookmark the permalink. While the Smashing Pumpkins have become a revolving door of musicians with only frontman Billy Corgan being the constant, the singer has revealed that an original member will be returning. In an interview with USA Today, Corgan revealed that original drummer Jimmy Chamberlin is set to return to the band for their co-headlining “The End Times Tour” with Marilyn Manson. Chamberlin last appeared with the group in 2009. Currently, the band are in the middle of an acoustic tour which doesn’t necessarily mean they need a drummer during the trek. Then, the realization hit Corgan, a drummer was needed for the upcoming trek. “We suddenly found ourselves in the situation of not having anybody lined up,” said Corgan. “We knew we could do the acoustic tour with some backing tapes and drum machines, stuff like that, but we’re also looking at the Manson tour in three weeks,” he continued. The publication was able to get in touch with Chamberlin about his return to the band and what it was like being asked by Corgan to return. “He asked if there was any way I’d consider coming back for the tour. It’s a great opportunity not only to celebrate the music, but to celebrate the friendship and the legacy,” said Chamberlin. “The End Times Tour” is slated to kick off on July 7 at the Concord Pavilion in Concord, CA and will wrap up on Aug. 8 at the Riverbend Music Center in Cincinnati. Corgan also revealed during the interview that once that tour wraps, he and guitarist Jeff Schroeder will head directly into the studio to start working on some new music which will become the follow-up to their recently released Day for Night. “We hope to have this next album out at the beginning of next year and a single out by the end of this year,” said Corgan. For full tour dates for “The End Time Tour,” you can find them here. This entry was posted in Music News and tagged Bill Corgan, Jimmy Chamberlin, Smashing Pumpkins, The Smashing Pumpkins, tour, tour dates. Bookmark the permalink. Earlier this week, Smashing Pumpkins’ frontman, Billy Corgan updated fans on Twitter telling them that he was currently on day one of writing new material for an upcoming album. Though that was all that the frontman said, this material could become part of the band’s 10 studio album, following last year’s released, Oceania. While the Pumpkins may have not been in the limelight as of recently, they have been busy with the reissue of their hit album, Mellon Collie and the Infinite Sadness which included hits such as “Tonight, Tonight” and “Zero.” They also have been keeping busy by performing at this year’s SXSW festival in Austin. While they might be in the writing process right now, the band will be heading out on a North American and European tour which will start in April and go all through July. 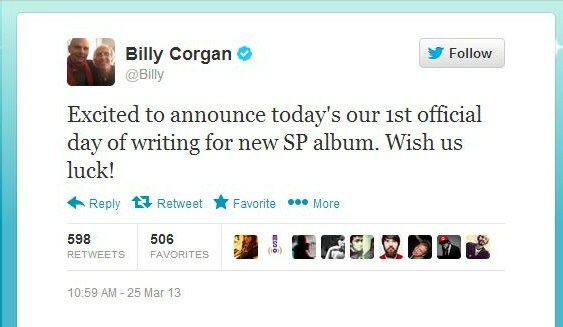 This entry was posted in Music News and tagged Billy Corgan, new album, new music, Smashing Pumpkins. Bookmark the permalink.